Common as muck but brilliant for a tough spot. 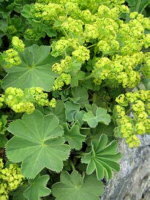 Plumes of lime green/yellow flowers in Summer. Wonderful for flower arranging and the leaves look magical with water droplets sitting on them. Very dry shade tolerant and resistant to deer and rabbits, plus the occasional football or foot. Often used at the front of borders and complementing other flowering perennials (it looks stunning when planted with Geranium 'Rozanne'), Alchemilla can also be used most effectively to create an area of differing foliage colours and textures - it combines beautifully with small to medium sized ferns. It will mildly seed around but it is just too useful to ignore! Cutting foliage and faded flower stems back in mid/late summer will produce a second flush of leaves and the odd flower.